22/11/2011 St John’s College communion. Eunice spoke of gifts as being signs and when on to speak of the feeding of the 5000 as being a sign of the promise, the hope and the reminder of God’s Kingdom. The image in its embryonic stage was of God watching over the world which He held tenderly in his hands but as the idea of communion and gifts and the story of Christ in the suffering and want of those in need, the world became a loaf being broken and the break formed as a cross, a cross reflected in the face of God. Then the image became ambiguous in that is God breaking the world? 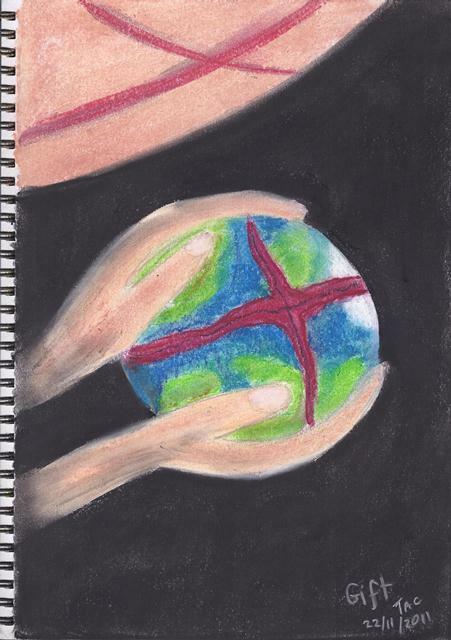 Healing the World or Holding (Sustaining) the world? Or all three? Or is there more? Christ is in the broken world, Christ is healing the world through the cross and Christ is the one holding the world. All will be well.